I questioned my sanity when I had to ring a list of people who may be able to have my children after school when I forgot to check whether my neighbour was actually available and when I set off to Inverness with the Yurt without the full address and telephone number of my destination. I will put it down to trying to think of too many things at once. I need to go back to old fashioned list writing and consider printing off all non junk emails. In the end, everything worked out fine and I had a clear run to Smithton, where I met Sandra who did a great job of looking after me. I was glad that Highland Quilters had a team to help me including two very patient men without whom things would have been tricky. The church hall had a brand new carpet so I was unable to chalk a 9 foot circle to mark where the wall trellis should be placed. Someone eventually had the bright idea of laying down bits of paper and after that things went really smoothly apart from breaking another roof pole tip – I will just need to have around 3 spares I think. The talk seemed to go down well, despite the audience sitting in a curve around the Yurt so I hope they all caught most of it! As we have had another week of good spring weather, I dyed some lengths of fabric for the roof of Yurt2. I dyed 6 times as much fabric at a time than was recommended in the instructions so the colours were lighter but they are still really good shades. I did some complicated calculations to work out the most efficient way of cutting the pieces and I intend to start quilting the long roof panels this week. 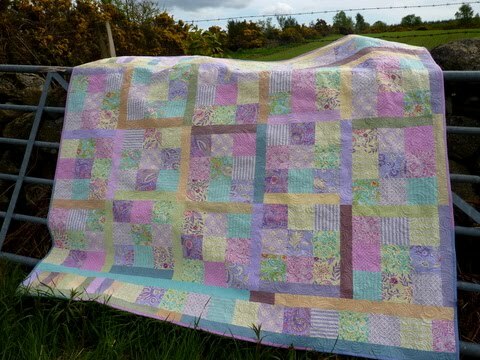 I have even loaded the Lenni frame with the Mo’s Hare panel so I need to pluck up the courage to quilt that too. 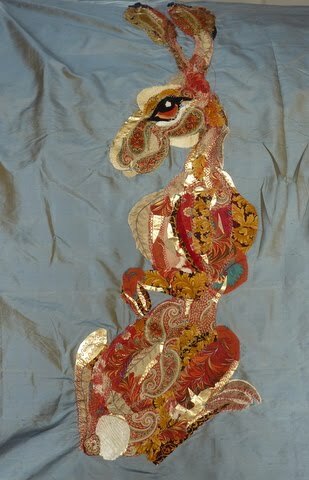 I am hopeful that it might do for a two-person category FOQ entry since I have not done any show quilts for over a year now. 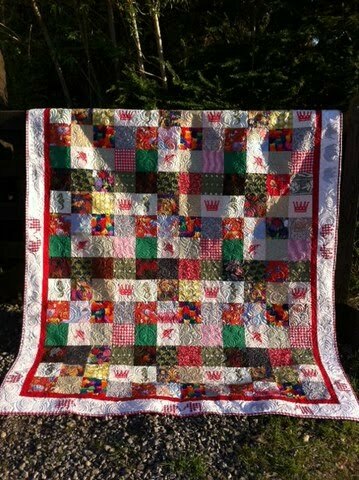 The sunshine spurred me on to finish Freya’s new quilt, take up the hems on Fenella’s new school dresses after she tried to squeeze into last year’s frock complete with woolly tights & sheepskin boots, and I even went on to clean out the summer house and garden yurt. 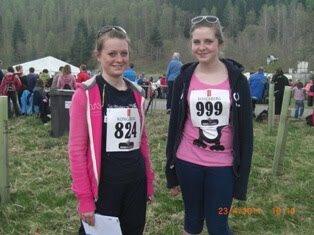 Freya and Millie entered the Balmoral Run for the first time and ran 2.5km in a very respectable 12+ minutes. Welly and Mabel willingly lined up for dog hair cuts. I looked up some recipes in case we decide to have a last-minute garden party to celebrate the Royal Wedding – I wonder if Prince William and Kate Middleton will have Coronation Chicken and Gin & Tonic Sorbet on their menu? The weather was pretty good this week, indeed, unbelievably fabulous on Sunday and we even ate outside twice at the weekend without everything blowing away. 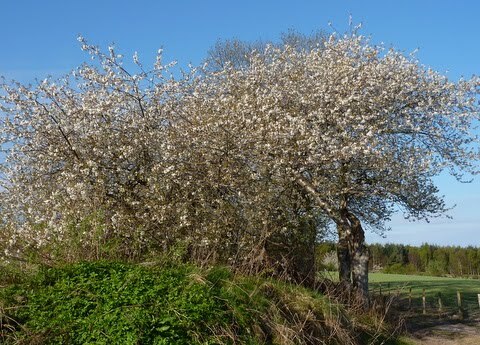 The ground is actually dry and the wild cherry blossom looks lovely. There are hundreds of white anemones growing through the dead, winter bracken that may inspire a Yurt panel when I remember to take my camera on a dog walk. Fergus got a new bike since he wasn’t looking forward to doing his cycling proficiency course at school on his sister’s old one which was purple and too small. I was rather taken by a traditional ladies’ bike with a wicker basket so wasted a little while on the Internet looking up Dutch bicycles in case I took a notion to cycle 4 miles for a carton of milk. Those bikes look such fun in Holland but the reality here in Scotland is that the main roads are too busy and the off-road tracks are too stony for that sort of contraption. As it was school holiday week two I felt concerned that I was not progressing with business related tasks so got stuck into finishing off 3 customer quilts and a tote bag project that had been hanging around for a while. The bag was a little frustrating because it had an odd windmill construction method and I did not find it easy to get the lining to behave. 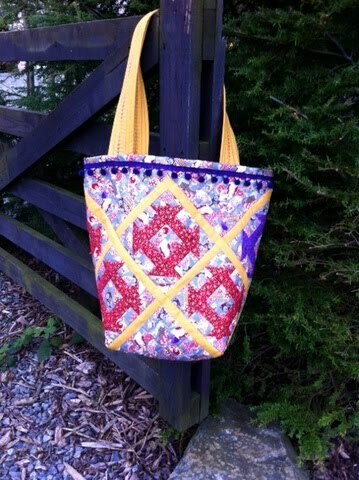 I had hoped to have alternating coloured churndash blocks but seem to have ended up with a red side and a purple side. 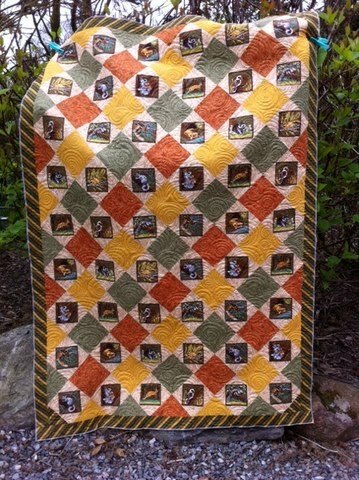 I utility quilted Catherine’s Aussie animals, Alison’s scrappy elephants and sewed the binding onto another quilt that I did before we went away. The faulty Kitchenaid mixer had to be collected and will be swapped for one that doesn’t mind making bread dough so I had a cooking frenzy one day trying out all of its attachments. It did a really good job of pancakes, pizza dough, mango yogurt ice-cream and also mincing cheese and basil. The children were impressed by all of this activity in the kitchen but after washing up a sinkful of dishes about 6 times I remembered why I am not a full time domestic goddess. The APQS Lenni on the 8ft Bliss frame arrived from the USA and I put most of it together by myself. It looks great and I have had a practice piece on it. I love my great big Millennium but I think the Lenni is lighter and far simpler to use. There are no adjustments to make on the track or wheels although I was a bit frustrated that there was some vibration at certain resonances. This improved dramatically after we took off the castors. I may have to do a few minor tweaks to get it running as perfectly as I would like. Space is now rather limited in my longarm room; I could do with being a bit slimmer to get past Lenni to the back of Milli but I would prefer to keep the other room free for workshops and small classes. All in all, I was pleased with my progress for the week and should be able to go to Inverness with the Yurt this week with a clear conscience – after I have done everything on my To Do list for Monday! We spent a great week on Mull despite some very wet weather that made part of the cliff wall collapse further down the street. It was like watching manufactured rain in a movie lashing across the bay. We did not get too bored as the children drew pictures of the colourful harbour front and strummed on the old guitar that we took with us. 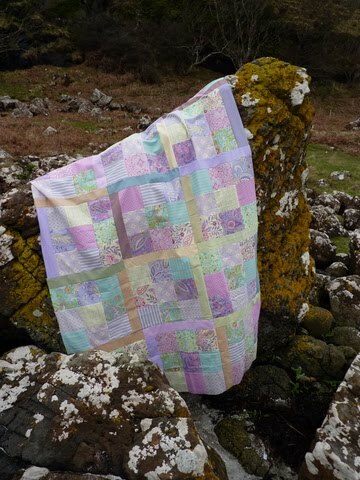 After I made Fenella’s Clothkits dolly with back to front arms, I pieced a quilt of simple squares. My husband kept thinking of errands to fetch from the multi-purpose chandler at the harbour that sold everything from cake decorations and harmonicas to fishing tackle and binoculars. I came up with plenty of ideas for remodelling the fisherman’s cottage that we were staying in. It was quaint and cosy but if it was mine I would have redecorated it with a nautical theme and antler coat hooks. It was not quite the tourist season so some places like the handmade cheese company were not open for business. We travelled all over the island in the Landy and took in the spectacular scenery, driving on twisting, plunging single track roads. Some of the settlements were extremely remote and you could drive for miles and not see a house or car. There were many highland cows and sheep wandering around and we kept a keen eye out for wildlife. We could not decide whether the birds of prey were sea eagles, golden eagles or just buzzards. We were fortunate to spot a sea otter, a mountain hare, a seal, and on the last evening a pod of five harbour porpoises swam around the yachts moored up in the bay at Tobermory. There were plenty of good places to eat out and the seafood was fabulous. At Mishnish, Cafe Fish, the Pub and the Chip Van we feasted on langoustines, mussels, oysters, crab claws, monkfish, scallops, and even squats which looked like large pink woodlice. I have to admit that we had fish and chips several times in one week but it was all so deliciously fresh. 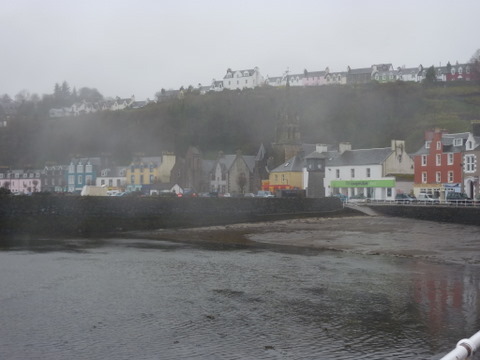 Our outings were delightfully simple – Tobermory museum, collecting shells and pebbles on the beach, and a foggy ferry trip back to the mainland to visit the most westerly point of mainland Scotland. There really was nothing much there apart from a few muddy cows grazing on the beach. The expedition to the neighbouring island of Iona was more successful as it was sunny and the children enjoyed looking for pieces of sea glass and green Iona marble on the small beaches. It was fascinating finding out about the geology of the area. Mull is a large island formed mostly from massive volcanic eruptions millions of years ago It was obvious to see that lava had flowed and bubbled to form most of the land mass. Apparently, the rocks on Mull are so old that fossils are rarely found as plant and animal life had not yet evolved. I signed up for Mobile Me, supposedly a productivity enhancing programme to link my computer, ipad and phone so that contacts and emails would all be synchronised over a technological “cloud”. However, I wasted a ludicrous amount of time trying to load it all up and get the gadgets to connect with each other. I really wonder whether it was me being dense and missing the obvious or whether it was actually far more complicated than necessary. It is still not quite all tied together with the computer but theoretically I can at least access and edit the calendar. I was very excited when my new Kitchenaid mixer arrived and immediately made a bucket full of mashed potato and cookie mixture. Strangely, it juddered alarmingly when mixing a batch of bread dough so I wasted yet more time on the internet trying to find out if it is normal for an industrial type of mixer to struggle with a basic loaf. It is not supposed to do that, of course, then I came across a website full of Kitchenaid complaints that I wish I had never read. Sadly, I have to pack it all up and send it back for a replacement which is frustrating. I made Freya’s chocolate birthday cake the old fashioned way and it tasted great. I finished off the couching and binding on Pi Sqaures on the new Elna machine and was pleased with the extra throat space. It is really annoying that it is around an inch too big for my Horn cabinet – if I lower the table I can’t plug it in! I was horrified at the cost of new, larger ones so may just get the basic Janome/Elna table instead of the hideaway cabinet. I eventually managed to get half of a customer quilt done, ordered more fabric and dye for Yurt2’s roof and got packed up for the family trip to the Isle of Mull. 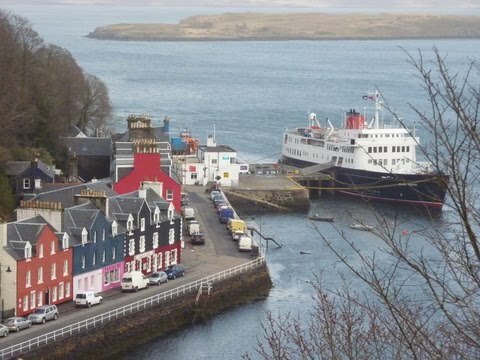 We had a very scenic drive through Perthshire to Oban to catch the Caledonian MacBrayne ferry across to the Island. It was only a 45 minute crossing; beautifully sunny and calm. 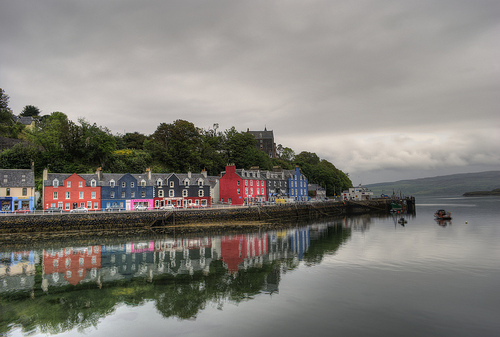 We drove on the single-track main road towards Tobermory with its brightly coloured houses on the harbour front. After settling in to an old fisherman’s cottage, we had a supper of freshly caught mackerel and chips from an award winning van on the jetty. We ate it sitting on the steps of the clock tower in a heavy rain shower as a double rainbow arched across the bay. I’m on the Isle of Mull without an Internet connection !